We are pleased to announce that the report from the IOCCG working group on Phytoplankton Functional Types (PFTs) has been published by the IOCCG after a tremendous effort by the Chair of the WG, Shubha Sathyendranath (PML, UK), and the authors of the various chapters. PFTs are of particular interest to the biogeochemical community because they are relevant proxies of ecosystem functioning and may play a role in climate change. IOCCG Report 15 entitled “Phytoplankton Functional Types from Space”, provides an overview of PFT concepts, examines various in situ methods for observing PFTs and how they relate to remote-sensing techniques, and examines the various algorithms available for detecting PFTs (or community composition, or size structure) from satellite ocean-colour data. Advantages and limitations of each method are identified to help users choose the right algorithm or data products for their particular applications. Furthermore, recommendations are provided regarding development of algorithms and validation studies for better retrieval of PFTs from space. The report is currently being printed by NOAA and will be mailed to subscribers on the IOCCG mailing list when available. An electronic copy of the report can be downloaded from the IOCCG website. The second successful IOCCG Summer Lecture Series took place at the Laboratoire d’Océanographie de Villefranche (LOV), (21 July – 2 August 2014). The course was sponsored by a number of local and international organizations including the US Ocean Carbon & Biogeochemistry (OCB) Program, the Scientific Committee on Oceanic Research (SCOR), as well as the French space agency CNES, and local organisations CNRS/INSU, OOV, LOV, CNES, GIS-COOC and UPMC, which are gratefully acknowledged. A total of 24 students from 16 different countries attended the training course, which was taught by 12 distinguished research scientists. Judging by the feedback from the students, the training course was a great success (see review from Matt McCarthy, one of the students). The students were exposed to a wide range of topics in a very short space time, addressing many of the current critical issues in ocean colour science. The PowerPoint presentations from all the lectures are now available on the IOCCG website, and the lectures were also video recorded and will be available soon. This material provides a useful resource for the many deserving students who could not be accommodated due to space limitations, as well as other researchers from around the world. A report of the training course will also be available in the coming months. Students and lecturers at the 2014 IOCCG Summer Lecture Series in Villefranche-sur-Mer, France (click to enlarge). The new IOCCG working group on Intercomparison of Atmospheric Correction Algorithms Over Optically-Complex Waters, chaired by Cédric Jamet, recently held their first WG meeting in Wimereux, France (see Minutes of the meeting). The goal of the WG is to systematically assess and understand the advantages, limitations and applications of selected atmospheric correction algorithms via a series of round-robin inter-comparison exercises. It was agreed that the scope of the WG would be limited to non-zero NIR water-leaving reflectances and that the report produced by the WG would complement IOCCG Report 10 (edited by Menghua Wang). Working group members also agreed that all algorithm codes plus the simulated datasets developed within the framework of the WG will be released to public, as far as possible. The working group will meet again before the Ocean Optics conference (26 October 2014, Portland, ME, 9:30-12:30). Another new IOCCG WG, examining Earth Observations in Support of Global Water Quality Monitoring, met for the first time in Washington DC (9-10 June 2014, see meeting summary). The WG aims to address science requirements to meet user needs for national and international water quality monitoring efforts. They plan to identify needs that can be filled by remote sensing and provide information on how to fully exploit current and near future sensor capabilities. The WG plans to meet again in Perugia, Italy in conjunction with the Fifteenth World Lake Conference (1-5 September 2014). The Oceanography Society is pleased to announce that Prof. George W. Kattawar has been selected as the 2014 recipient of The Nils Gunnar Jerlov Award recognizing his contributions to the advancement of our knowledge of the nature and consequences of light in the ocean. Dr. Kattawar is internationally recognized for his contributions to radiative transfer theory and its applications to light propagation in the ocean. His work has centered on the use of polarization to study a wide variety of theoretical and applied topics in oceanic optics and related fields, including three-dimensional geometries and time dependence. He has mentored over 40 graduate and postdoctoral students, and his courses and lectures have received numerous teaching awards. He has also served on many government and academic advisory committees. Dr. Kattawar received his Ph.D. in Physics from Texas A&M University in 1964, and he has been at Texas A&M since 1968, where he is now professor emeritus. Dr. Kattawar will be honored during a ceremony on 30 October 2014 at the Ocean Optics Conference in Portland, Maine, USA. To learn more about the Jerlov Award, please visit: tos.org. The maximum peak height (MPH) algorithm (Matthews et al. (2012) has been released as a plugin for the BEAM toolbox. The algorithm gives estimates of chlorophyll-a for near-coastal and inland waters as well as identification of cyanobacteria blooms and floating vegetation from MERIS L1B data corrected for Rayleigh effects. The processor was developed by Dr. Mark Matthews (University of Cape Town), Dr. Daniel Odermatt (Brockmann consult) and developer Tom Block (Brockmann consult). The original algorithm was modified to give improved performance in oligotrophic and glint affected waters, over floating vegetation, and flagging of pixels affected by the adjacency affect (Matthews & Odermatt, “An improved MPH algorithm for the BEAM toolbox“, forthcoming). It has been validated using a global chlorophyll-a dataset in the scope of ESA’s Diversity II project and is the best performing algorithm for eutrophic lakes. It should be of interest to many scientists working in spatially constrained and inland and near-coastal waters affected by cyanobacteria blooms. The plugin called the MPH Processor V1.3.3 can be downloaded from the BEAM Project website. 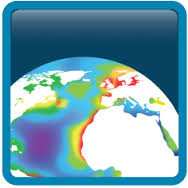 The ESA Ocean Colour – Climate Change Initiative (OC-CCI) project focuses on the ocean colour “Essential Climate Variable” encompassing water-leaving radiance in the visible domain, derived chlorophyll and additional products that include some inherent optical properties and diffuse attenuation coefficient at 490 nm. OC-CCI is currently in Phase 2, which started February 2014, and aims to follow a cyclical update process of Review>Improve>Produce>Assess. The activities include requirements management, algorithm development & selection, system evolution, production and product assessment. At the end of 2013, the project released Version 1 of the OC-CCI product comprised of global merged MERIS, MODIS-Aqua and SeaWiFS data with associated per-pixel uncertainty information. The data from MERIS and MODIS-Aqua are band-shifted to SeaWiFS bands, and corrected for inter-sensor bias before merging. Data are available as Level 3 mapped (geographic and sinusoidal projection) files in netCDF and PNG formats from 1997 to 2012, as both daily and monthly composites. A revised dataset is planned for release in early 2015. The data can be downloaded via FTP, a Composite Browser or OPeNDAP, and there is also a Web GIS Portal for interactive viewing (see www.oceancolour.org/ to access the data). The tools include plugin readers for BEAM and SeaDAS (consult the Product User Guide for further details). Please note this is a brand new product and so, in spite of the best efforts of the OC-CCI team to check the quality of the products, some errors may still remain. The Project Team would be grateful for any feedback on issues that you encounter (help@esa-oceancolour-cci.org). There is also support via a FAQ page. We gratefully acknowledge the support we’ve received from ESA, NASA and the community at large in developing this new merged time-series product. Several new publications have been added to the IOCCG Recent References list, including a paper by Brown et al. (2014) entitled Seasonality of oceanic primary production and its interannual variability from 1998 to 2007. 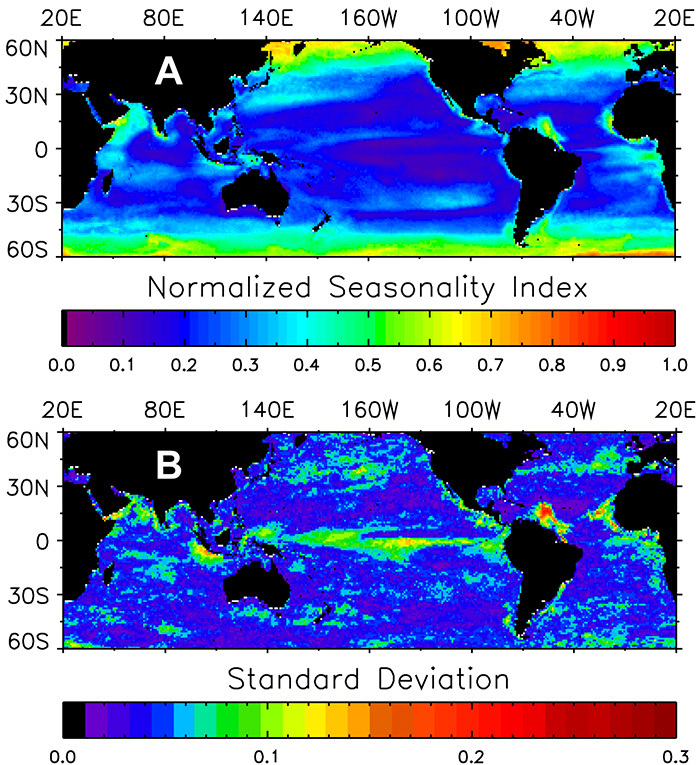 The authors quantified the seasonality of satellite-derived, oceanic net primary production (NPP) and its interannual variability during the first decade of the SeaWiFS mission using a normalized seasonality index (NSI). The NSI, which is based upon production half-time, t(½), generally becomes progressively more episodic with increasing latitude in open ocean waters, spanning from a relatively constant rate of primary productivity throughout the year (mean t(½) ~5 months) in subtropical waters to more pulsed events (mean t(½) ~3 months) in subpolar waters. This relatively gradual, poleward pattern in NSI differs from recent estimates of phytoplankton bloom duration, another measure of seasonality, at lower latitudes (~40ºS – 40ºN). These differences likely reflect the temporal component of production assessed by each metric, with NSI able to more fully capture the irregular nature of production characteristic of waters in this zonal band. (A) Mean and (B) standard deviation of the normalized seasonality index calculated from VGPM net primary production from 60ºS – 60ºN for the years 1998 to 2007. Polar latitudes were excluded because of inadequate sample size. VGPM = Vertically Generalized Production Model (click to enlarge image). The interannual variability in NSI was generally low, with higher variability observed primarily in frontal and seasonal upwelling zones. The influence of the El Niño-Southern Oscillation on this variability was clearly evident, particularly in the equatorial Pacific. The authors suggest that NSI be used together with other phenomenological characteristics of phytoplankton biomass and productivity, such as the timing of bloom initiation and duration, as a means to quantify phytoplankton seasonality remotely and monitor the response of the oceanic ecosystem to environmental variability and climate change. In another new paper by Loisel et al. (2014), the authors examined the spatio-temporal patterns of suspended particulate matter (SPM) in coastal waters under the Mekong’s influence using MERIS full resolution data from Jan 2003 to April 2012. A new algorithm was developed and the impact of atmospheric correction errors quantified. The authors explained the origin of the seasonal evolution of the turbidity zone and identified deposition (in front of the delta) and erosion areas (north and south of the delta – see figure below). While the temporal variability was strongly dominated by the seasonal component, a long term trend of about -5% SPM concentration per year (more than 50% over the considered time period) was observed in the pro-delta area and was attributed to the decrease of the Mekong river sediment output during the high flow season. The reported SPM spatio-temporal patterns reflect and integrate the combined effects of natural and anthropogenic forcings. This may have a drastic effect on the coastline stability and coastal biological processes. Detailed characterization of the suspended marine particles will be performed on data collected in June 2014 during a cruise on board the ALIS French vessel (IRD) in the frame of the CNES/ TOSCA/VITEL project. 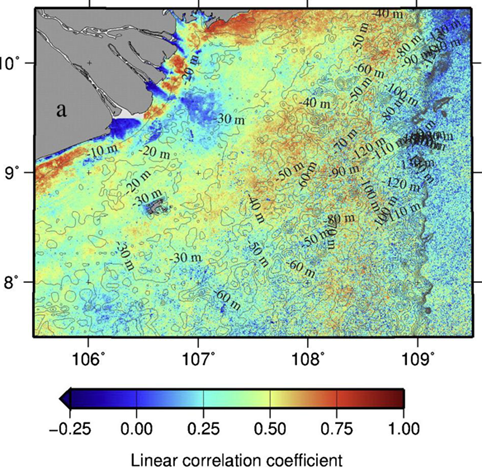 Correlation maps between SPM and intensity of the waves (click to enlarge). Lastly, Shi and Wang (2014) published a paper describing, for the first time, how to derive water inherent optical properties (IOPs) such as bbp(λ)at the near-infrared (NIR) band over the highly turbid China east coast region. Three-year observations of MODIS-Aqua data (2009–2011) were used to carry out this study. Normalized water-leaving radiance nLw(λ) at the red, NIR, and shortwave infrared (SWIR) were characterized and quantified after they were derived from the SWIR atmospheric correction with a band set of 1640 and 2130 nm. The NIR ocean reflectance spectral shape represented by the NIR reflectance ratio at 748 and 869 nm is highly dynamic over large areas of turbid waters. 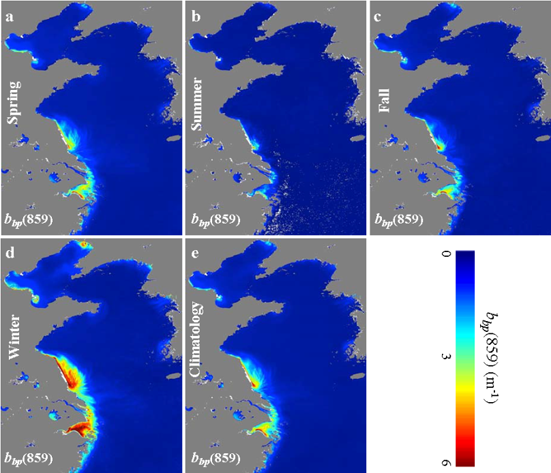 This study demonstrated that ocean IOP modelling can be significantly simplified in the coastal turbid waters and that it is feasible to analytically derive accurate IOP data for turbid waters with combined satellite-measured visible-NIR nLw(λ)spectra data. IOP properties such as bbp(λ) can be derived from satellite nLw(λ) measurements in the NIR wavelengths. Backscattering spectral slopes can also be reasonably derived in the coastal turbid regions. Three-year means of backscattering coefficient at 859 nm derived from MODIS-Aqua (2009-2011) for (a) spring (March-May), (b) summer (June-Aug), (c) fall (Sept-Nov), (d) winter (Dec-Feb), and (e) 3-year climatology (click to enlarge).